NAPA of Gettysburg, Hanover and Taneytown started out as just one small auto parts store on South Washington Street in Gettysburg on April 1, 1968. The automotive aftermarket had long been a part of Sam’s life when he decided to start this business. As a kid, Sam delivered auto parts on his bicycle for the Waynesboro NAPA store. After high school, he spent several years working hard for the Waynesboro store and eventually aided in opening two new stores in Mercersburg and Greencastle. Sam decided at 26 years old that he was ready to build a successful business of his own. Mary left her job at Landis Tool Company so that together, she and Sam could open Adams County Auto Supply Inc. Since the store first opened in 1968, a lot has changed. After a few moves, Adams County Auto Supply has settled in its current location at 340 E Middle Street in 1981. 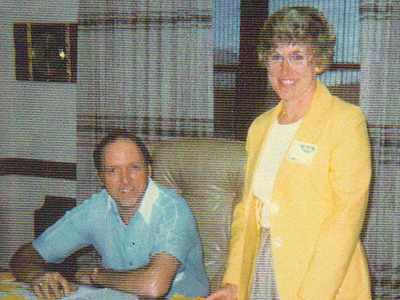 Both of Sam and Mary’s kids, Carol and Brad, joined the business after graduating from college in 1987. Together, Brad and Carol worked at the Gettysburg location for many years and took over upon Sam and Mary’s retirement. Eventually Brad decided that he had a different vision for his future and moved on the become a real estate agent. You can still find Carol at the Gettysburg store, along with her daughter Julia who joined the NAPA crew after graduating college in 2016. Sam and Mary opened a few other stores along the way – Mason Dixon Auto Parts came to be in 1978. Sam opened this store alongside a partner, Dave Reasner, at 117 E Baltimore Street in Taneytown MD. Dave managed the daily operations in the Taneytown store for a number of years, and was joined by his daughter, Rachael in 2007. Since then, Dave has been able to step back and let Rachael take the wheel. The latest addition to the group was Five Points Automotive which opened in 1987 at 285 Frederick Street in Hanover. Carol’s husband, Lonn, performed most of the renovations to the then pizza shop to make it suitable to become an auto parts store. When doors opened at the Hanover location, Lonn took the position of manager and that’s where you can still find him today. Between the three stores, Sam was able to service all of Adams County, western York and northern Carroll County. To this day, this group of stores offers the best range of inventory available and is constantly increasing to best serve its customers. Although Sam is no longer with us, his legacy lives on. He started this business with a goal to be great. He was dedicated to serving his customers by supplying them with quality parts, timely delivery, and the most knowledgeable employees he could find. He worked hard and did whatever he needed to do to maintain a thriving business. To this day, the values Sam began this business with are top priority. NAPA of Gettysburg, Hanover and Taneytown has always been and continues to be a family owned and operated business. Carol, Lonn and Rachael work tirelessly to uphold the reputation that Sam, Mary and Dave built in their many, many years in business. © Copyright 2013 NAPA AutoCare Center - Gettysburg, PA. All Rights Reserved.